At this moment in my dissertation work, I am transcribing my two-hour interview with ecologist Daniel H. Janzen. In early December 2007 I flew to Philly and stayed there for one night, interviewing Janzen in his office at the University of Pennsylvania just 6 hours before I flew back to Toronto. Clearly, I have waited far too long to transcribe the interview, which is typical of me. I am always excited to rediscover what I learned during an interview. Somehow I manage to forget almost everything we discussed in the minute after an interview ends—it’s as if my intense relief that it’s over triggers some sort of spontaneous amnesia. So there are always many pleasant (and some excruciatingly embarrassing) surprises awaiting me. But I find the process of the transcription totally grueling. I really try to get every “um” and “ah” and grammatically disastrous sentence recorded for posterity, and this requires a lot of rewinding. In the case of Janzen, who sprints from topic to topic in a rusty Minnesotan accent, rarely pausing for the insertion of a period or comma, my rate of transcription slows down considerably. Not to mention that there are so many more words per minute in this interview. I am 1 hour and 36 minutes into this interview and I have a 15-page transcript already. There is a lot of good stuff here. There’s an absolutely incredible story about botanist G. Ledyard Stebbins, who purportedly slept through Janzen’s thesis defense, but woke up just in time to compare the ants that Janzen studied to the chemical defenses that other plants produce, which protect them against attack by herbivorous insects. At that moment, Stebbins gave Janzen what would become one of his most persuasive analogies. Some background will help you understand this analogy. 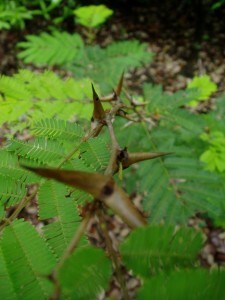 Janzen’s dissertation research in Mexico exhaustively detailed the mutualistic relationship between “bull’s-horn” acacias and acacia ants. As a graduate student in entomology at Berkeley, his first notion was just to study these ants—why were they so bizarrely fond of these prickly acacia trees? It was by chance, or at least “serendipity,” that his attention shifted to the relationship between the ants and the acacia tree. In his thesis, he concluded that there is a real mutual reliance between the two species. The ants cannot live without the acacias: they take shelter and breed in the acacia’s oversized thorns and feed from the plant’s nectaries and Beltian bodies (little nutritive tabs that grow at the leaftips of the acacia). 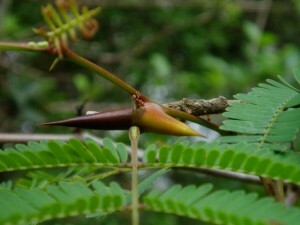 Conversely, acacias that grow without a resident ant population rarely thrive. Without the ants to fight off other insects and the choking lianas that like to drape themselves across other plants, the acacia falls prey to both herbivory and competition with other plants. Now, Janzen was not, by any means, the first to turn his attention to this surprising relationship. Thomas Belt, a 19th-century British mining engineering who worked in Nicaragua for years, called the ants a “standing army” that defends the acacias against their enemies. Harvard entomologist William Morton Wheeler challenged the claim that the ants were protecting the acacias, writing in the early 20th century that plants needed ants like a dog needs fleas. Strong words, gentleman! A raging academic debate that did not subside till Dan Janzen’s paper, “Coevolution of Mutualism Between Ants and Acacias in Central America,” published in the journal Evolution in 1966. One of the things I’ve always loved about evolutionary biology is the evocative language that biologists use to describe processes and relationships. Are the ants a “standing army” or a pack of voracious sap-sucking fleas? Gives you two pretty distinct ecological pictures, right? The study of coevolution between plants and insects has been built upon suggestive language like this. This was a field that came into being during the Cold War, so who could really resist using the term “arms race” to describe the back-and-forth evolutionary responses between plants and insects? Plants escalate their toxic biochemical defenses against hungry herbivorous insects, and insects escalate the tools they use to overcome those defenses. So, what does it mean to claim that acacia ants function just like the chemical defenses used by other plants to fend off the insects that would eat them? First, this analogy crosses categories: the ants, organisms in their own right, become (merely?) evolutionary adaptations of the acacias. The ants are, Janzen would claim, an extension of the plant’s genome—in the same way that human technologies are extensions of our genome (which he also claims). In essence, then, the ants become an adaptive technology. But an analogy always operates in two directions. The reciprocal effect is to grant the chemicals produced by plants a new identity. The best analogies (just like the best metaphors) associate entities that seem, otherwise, completely dissimilar. In this case, the analogy between ants and plant chemicals breaks a long-accepted boundary between what animals can do and what plants can do—or, rather, what plants can’t do, passive pieces of green furniture that they are. I mean, when we talk about animals, we use active verbs. We see them causing things to happen, acting—in short—with agency, if not intentionality. Plants, on the other hand, when they’re not simply invisible, don’t tend to act. They don’t move, they have no sensory organs. Even when we see them, we don’t think of them as agents. Even when a plant has an effect on its environment, it appears somehow passive, and the effect is often considered a by-product of some other more planty function. Coevolutionary analogies, by contrast, make plants and animals equal partners. More accurately, they’re adversaries. And plants, so long seen as the wallpaper of the world, suddenly become embattled veterans of an ancient chemical war with animals. This kind of transmission of meaning and agency between plants and animals has real effects on science (this is one of the themes of my dissertation). It’s one reason that I became so interested in Janzen. The man analogizes like it’s going out of style. More importantly, he is very careful to distinguish between “analogy” and “metaphor.” Janzen does not speak in metaphors, because metaphors make comparisons that could not be literally true. If he makes a comparison between, say, armyworms gobbling up an entire field of corn and Germany invading Poland, he does not mean this comparison metaphorically. To him, hungry caterpillars and power-hungry humans are the same thing. The entities interacting are unimportant: locusts or leopards, hummingbirds or humans, it doesn’t matter—only the interactions themselves are important. Janzen describes this as a fundamentally ecological perspective on the world, but I see it as a fundamentally evolutionary perspective, instead. In evolutionary biology, limbs or organs are analogous when they perform the same biologically adaptive function but have different evolutionary origins. When Janzen draws an analogy between human warfare and plant-insect warfare, this is also what he means: same adaptive function, different evolutionary origin. Ants or wild parsnips, humans or cockroaches—we might organize them into different categories, but evolutionarily, they are all subject to the same forces. It’s part of what gives evolutionary biology its explanatory power. And also, let’s face it, what makes it so darn fascinating. 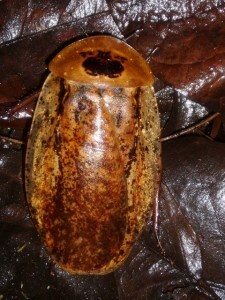 This is one good-looking cockroach, right? Also from Santa Rosa National Park. ← Previous Previous post: An example of how much irony you can pack into a story that ends with an iron padlock (plus a pun). Next → Next post: The confusion over funding basic science is about much more than an ignorant Canadian chiropractor. our inherent bias towards things that look and act like us (or, to put it more succinctly, our narcissism) is summed up very nicely here with your analogy of plants as “the wallpaper of the world.” maybe fungi could be considered the wallpaper glue, then? Also I think we have an “inherent bias” based entirely on communication. If we (collectively as a species) don’t understand another species’ mode of communication, we automatically categorize that species as “lesser.” I think of the phrase “dumb animals” here, with which we generally refer to mammalian species. Insects, reptiles, plants, and indeed fungi don’t even hit the radar screen. What I find particularly irksome about this point of view is that on a molecular or cellular level, those “lesser” species often have some of the most sophisticated communication systems imaginable. Okay, not being an educated scientist I still enjoyed the posting. Much to “chew” on! I have never thought of plants as wallpaper, they occupy a focal point of living for me….